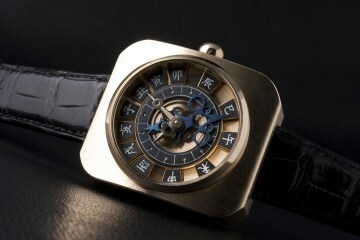 This is the Masahiro Kikuno's Temporal Hour watch. This watch was constructed in 2011. This is the world's first "Automatic wari-koma dial watch (Wadokei)" possessing an automatic index adjustment for each season. The "Temporal Hour" system is the practice of counting hours depending on the time of sunset and sunrise. The hours between sunrise and sunset are divided into six (6) and then used as one "counting" unit.